Let your mind be suffused with angelic love as you bring greater fluidity to your thoughts and develop new ways of thinking. 24 inner journeys from Sananda with introductory talks from Christopher. A course to help you access the wisdom, light and love of the angelic realms. Introducing Angel Mind reveals the early stages of the immense sea of light which is the angelic mental body. You will learn how to enter this space through your own mental body and how to become increasingly receptive to the gifts of clarity, fluidity of thought and inspiration that the angels offer us. 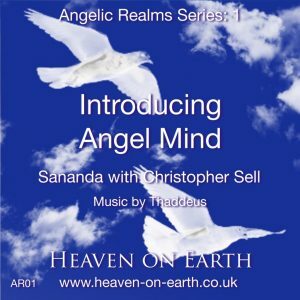 With talks from Christopher and inner journeys from Sananda you will be guided to develop new ways of thinking and being as you explore the nature of mind and learn how we may begin to infuse the human mind with angelic thought. The inflow of angelic wisdom and understanding enables you to lift into a higher state of consciousness in which much that was previously opaque becomes transparent. That is to say, the density of the earth plane is illuminated by the light contained within it. The human mind is one of the places through which this process of illumination can be initiated. The substance of which your mind is made is especially susceptible to illumination, and all the experiences of your life have prepared you for it. Welcoming angelic light into your mind can be profoundly transformative and assist you to enrich your life in all its aspects. 24 talks and 24 inner journeys as mp3 files with study notes as pdf files in a choice of A4 and US Letter formats + all these bundled as a zip file if you prefer to download them as one.